If both titles have been dubbed in another language, you will see more options directly after the anime info and before any matches. All data for the site comes from MyAnimeList.net. Due to the way this site works, it would be a horrible idea for the site to pull data from MAL as it's requested. Pages would take forever to load, the entire site (and my VPS) would get slow, and I'm sure MAL's servers would not appreciate getting hammered for simple requests. To prevent that, new titles are added semi manually. I have a script that I run to get all the necessary data from MAL for this site to work. That data is then stored in a database so we can play around with it a bit. Since data is only added when I run this script, our database is very incomplete. To get some content going I've added all the titles in my anime list, the top 500 popular and scored on MAL (as of a few months ago), and a handful of titles that are currently airing. why don't you have ____ in the database? The real reason you can't find what you're looking for. Because I have to add them in myself, the database only contains series that I've added. I hate not having what someone wants, so if you do find something missing, let me know and I'll get it added as soon as I can. It is also possible you are searching for a title based on a nickname (like DRRR for Durarara!!) that I was not aware of, or the English title when MAL has the Japanese title. Try searching by the title from MAL, or the ID associated with it (up in the address bar when you're looking at the anime on MAL, those numbers). If you do find what you were looking for this way, still let me know how you would have liked to have found it so I can make it easier to use the site! I'm looking at some incomplete data here! half the cast is missing! dafuq? Very possible. What sometimes happens is a series still airing will not have the completed cast listed on MAL when I pull the data. During development this happened with Hyouka a few times, the cast was being updated as the episodes aired. Again, let me know of the problem and I'll get the database updated as quick as I can! I like stats and numbers. Sure, numbers are neat. Currently the database contains 1,944 anime titles and 9,264 voice actors / seiyuu who gave a voice to 33,404 characters! Can I see a list of the anime recently added to the database? If you're at all interested in recent changes to the site, check this page out. It will be updated with anything I do around here to make this place better or worse depending on how I'm feeling. Speaking of changes, did you fix anything recently? Old data is crap data. If you're looking for proof that I'm actually maintaining this site, here are the last 5 titles I've updated! Pro Tip: If you report a problem, include an Email. I'll let you know once I've fixed it! 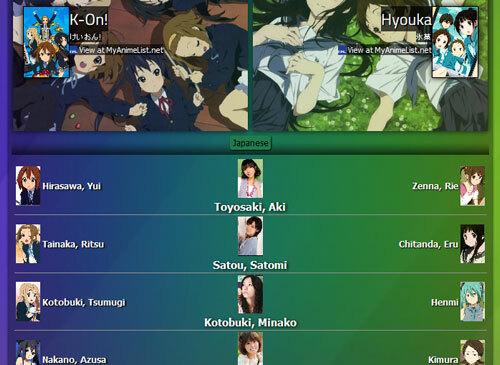 I also added a full list of all anime, sortable by when they were last update!